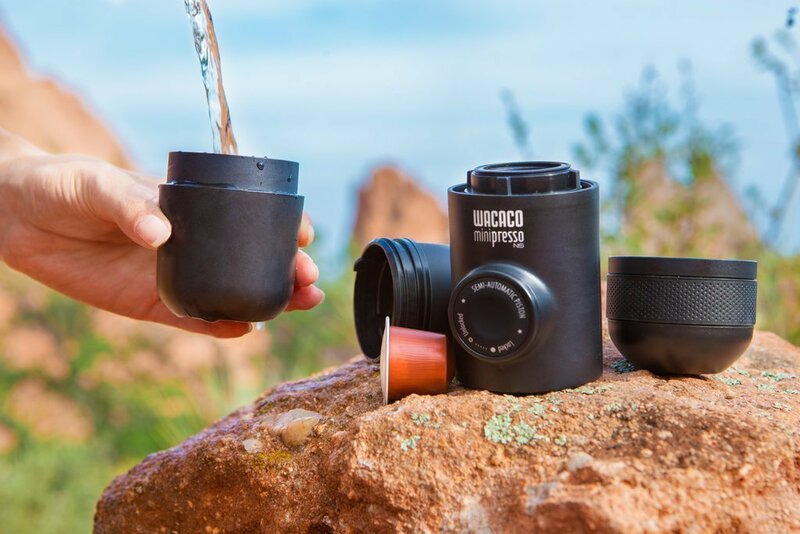 If you want to have a great cup of Nespresso wherever you are, you may be interested in getting yourself a Minipresso NS, produced by Wacaco Co Ltd. This convenient, portable espresso machine make it easier for you to perform your favorite part of daily routine under all kinds of circumstances. The only things you’re going to need are the Nespresso capsules (or Nespresso Compatible Capsules) and hot water. Read our review to find out more about Minipresso NS. If you are a true Nespresso fan than you do not need to read review to decide to buy Minipresso NS. Knowing that you can drink your Nespresso everywhere and anytime is enough for you to know that Minipresso NS is one of the best portable invention. If you are a fan of the regular espresso than this list Best portable espresso machine 2018 is right for you to find great portable espresso maker for your needs. With extremely convenient dimensions (6.9 x 2.75 x 2.4 in) and practical black design, Minipresso NS can easily become your best friend on the go since it is also pretty light – it weighs just 0.8 lbs. It comes with a 2.35 oz water tank and the average pressure provided is 116 psi. It is made from food grade plastic, and it is BPA free. It is a hand operated coffee maker that works perfectly both without the electricity and without the use of batteries, N2O cartridges, or compressed air. You should have in mind that Minispresso NS uses only Nespresso capsules, which provides you with perfectly ground, measured, and precisely tamped nespresso coffee. The only effort that you will have to make on your way to your quick cup of coffee is to press the pump that will pour the coffee into your cup. Apart from the fact it is a compact coffee maker whose weight and dimensions make it easily fit all kinds of bags and backpacks, Minipresso NS is also considered convenient owed to the fact it leaves the minimal mess after the usage. When it comes to cleaning, you should have no worries. Its practical design allows you to easily reach all inner parts and clean them thoroughly almost effortlessly. If you want to make it even more practical on the go, you can use its water tank as the storage place for the unused capsulas. This way, Minipresso lets you save some room in your luggage. Additionally, to avoid the need of bringing cups or mugs with you, you can use the cap of the coffee maker to drink your coffee from it, which is especially convenient if you are hiking and backpacking. Hot water is definitely the best friend of Minipresso NS. To prepare coffee using this coffee maker, make sure to prepare (warm up) the water wherever it works for you since the maker does not have a heating system. In other words, it could be useful for you to get yourself a tea kettle or another system that will not take too much of your time on heating the water. 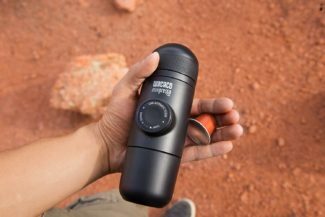 Depending on where you are preparing your coffee, you can use an insulated water bottle, or a microwave, and if you are looking for something even more practical just look around and get some hot water wherever you can – usually you can easily get it in coffee shops, fast food service windows, etc. When preparing your coffee with Minipresso NS, make sure to use only the original Nespresso capsules. Yes, there is a large number of similar capsules that may fit perfectly in this coffee maker. However, they will not guarantee you a good quality cup of coffee. Manufacturer's 1 year warranty against defect to repair or replace Money back guarantee 30 days from date of purchase. 1 year manufacturer's warranty against defects, repair or replace. Customer pays mailing. 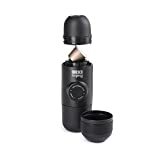 Minipresso GR handheld espresso maker is as simple and as convenient as Minipresso NS. They have the same dimensions as well as weight, and they both have sleek and modern black design. However, if you are interested in buying one of them, no matter how similar they seem to you, you should know that there is an important difference – they produce coffee liquid in two different ways. You can read Coffee Supremacy Minipresso GR Review. This device is top rated in our list Best portable espresso makers. Minipresso GR actually does not use capsules like Minipresso NS – this portable espresso maker is designed and constructed to let you prepare coffee from your favorite ground coffee powder, which means that you do not have to buy the capsules but just have your freshly ground coffee with you. The preparation procedure is pretty simple – you should add the ground coffee to the filter basket using the integrated scoop, pour hot water into the water tank, and use the pump to produce up to 50 ml of your favorite coffee in less than a minute. In accordance with the stated above, if you are willing to buy one of these products, make sure to get the one that suits you better. On the one hand, if you enjoy coffee based on Nespresso capsules, you should go for Minipresso NS. On the other hand, Minipresso GR is a perfect choice if you prefer using your own ground coffee. Next story Nespresso Inissia vs Vertuoline Evoluo Comparison – Which nespresso machine is better for you? The only disadvantage Minipresso Ns has is that it can not boil water. Cisno can, but I’m not ready to pay 3 times more for that coffee maker. For now, I am extremely pleased with my Minipresso. If you exclusively drink Nespresso (like me) coffee, this small appliances you must have.